Reflecting on 2016, telling MANA’s story and the narratives of midwives around our country, I believe storytelling is of great importance. During my time as president, I have learned that stories about midwives are written almost every day, and depending on the storyteller the versions of midwifery life and history are vastly different. Our stories help shape how we integrate the work that we do, the reasons we do it, and ourselves as players in this world. Over the past years as MANA president I have watched as stories are written and rewritten, and affirmed to be truth, when just the day before I perceived a completely different unfolding of the event. With this end of year narrative, I want to remind you that your stories profoundly matter, especially if they are the deepest and most truthful recountings. In your hands that have caught countless babies and held many hands, you must hold your experience as a midwife and examine it. You are a hero, and your story is a “Hero’s Journey.” You have met great challenges face on, with doubt and humility, and in the end, have overcome and triumphed. Great gains have been made: the collective ‘we’ created this beautiful direct entry credential (the CPM) and formed the Midwives Alliance of North America as the midwifery association for the community midwife. Licensure, in states that look like tiny puzzles of legal language and challenges, all different, has been hard won. These stories of our time as midwives living in the United States are real, and yet there are many versions. Particularly in the echo chambers of social media and group think, there is a pressure to want there to be only one strongly held narrative of our midwifery experience. The backlash of this is a subtle death of narrative, midwives no longer interested in the individual’s story but instead communication of various types of academic information. These bites of information (via research or online forums such as social media) are becoming code for how we are identifying our work and rightful place as midwives. As we look to the future of fast paced research and dispersal via social media, the midwifery model of care becomes a foundation for practice upon which we should return to in times of personal resilience. When I was in Canada an aboriginal elder reminded me that Evidence Based Medicine is important, but so is our Personal Based Medicine. Over the past years, like storytellers do, I have improved upon (and become more protective of) my own midwifery narratives. For instance, I am thoughtful about the story of “traditional midwives.” The traditional midwife in my own storytelling is a person from a community in which midwifery has been colonized and who is reclaiming that tradition. Past narratives, including my own, have made the traditional midwife an elder, with little formal education and who is steeped in the mystery of ritual. This is a good story. But a more important narrative NOW is about the traditional midwives who are in their 20s, graduates of MEAC or CNM/CM programs or CPMs/LMs via a direct entry pathway and who are working desperately for equitable access to midwifery. These are young activists recognizing the injustice of the colonization or the history of slavery that took midwifery out of their community generations ago, and who want to see it re-planted for their people. It isn’t as popular a story for mainstream America. Yet, the story of the granny traditional midwife, beloved as it is, has not helped the modern day young midwife who wants to be included in every system of care, or even those granny midwives who have no access to education, licensure, or economic stability. So narratives about midwifery, and how they are told, matters. Midwifery has a history of forgetting to be inclusive, and a reputation of being divisive. As we examine our narratives, let us begin to find ways to have our stories build bridges of engagement so that we are stronger as a profession. For similar reasons, the story of MANA has been changed. I was asked at open forum a few years ago: “Why is MANA even relevant now?” The creation story of MANA is brilliant, but I recognized this question as bitterly hopeful for the future. As we create the future vision for MANA, we do return to our foundation of supporting dignity and justice for every midwife, regardless of credential or pathway to learning. We were the first in the midwifery association realm to make social justice our strategic direction in the United States, recognizing that it was time to end the resounding inequalities in midwifery, and now have future plans for projects and continued board commitment. We represent home birth! Proudly. MANA, together with our community, produces the studies and data to back up the quality of homebirth midwives. Currently, our board has every midwifery credential represented (including the doctor who is a midwife!) and has been a consensus based organization since the beginning. We can make no major changes to bylaws or elected positions without direct input from our members. This in-person and direct relationship we have with members is our own version of the Slow Midwifery Movement, both a source of great pride and occasional frustration when MANA acts like the old mothership, rusty in places but solid in the sky, disrupting the fancier models of decision making for old fashioned communication. I love that MANA takes the time to be considerate, especially after my time in presidency where I have seen meetings dominated by fast talkers and decisions made almost on a whim by people in power who are not coming back to their constituents for their perspectives. When I spoke in California this past year, I presented a talk called "Midwives are the Resistance" and gave it a Star Wars theme. It was fun and reminded midwives that we really ARE the original resistance and that MANA is the original rebel alliance in our shared national midwifery. But, more importantly, it was a reminder that midwives are Heroes. 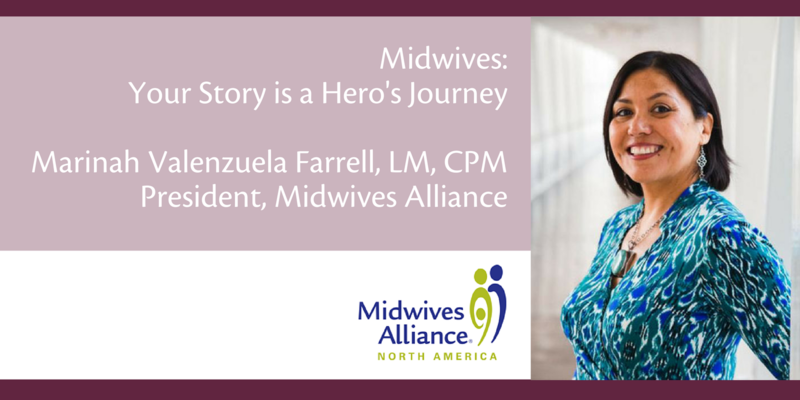 Our story is the hero story, and MANA wants to encourage you to be the midwives you were destined to be. We support your profession, and also your personhood. We know that you are more than “a member” or “a midwife.” You are complete person that needs to be recognized by your association. As I end my Presidential Term, I look forward to continuing my work in the innovative and exciting Division of Access and Equity, the division working on better ways to communicate with states and find ways to help midwives on the ground. My term ends officially in April, so elections are coming up and I encourage you to vote. I hope that you will consider always being part of the MANA family with your membership, that your state will join MANA as a Community Partner, and that you will one day volunteer with MANA. Even a small donation of money or time can have a significant impact. I hope you are excited for 2017. May your narratives be hopeful, and your activism strong. Thank you Marinah for this great blog. Creating the space and spaciousness for midwives voices to be heard is critical work. This kind of deep listening has the power to eventually transform a system.